With the Nest Cam Outdoor, you'll always know what's happening on your doorstep. The smart home security camera sends you phone alerts when motion or sound is detected and lets you speak directly to anyone within earshot of the camera. The Google Home Hub included in this bundle is a smart home controller, digital photo album, and smart speaker--all in one! This bundle brings you both premium home security and straightforward control of smart devices. The Nest Cam Outdoor offers superior protection for homeowners who want to be able to keep an eye on their property from anywhere in the world. When you get home, you can check in on the camera's live stream on the Google Home Hub's touchscreen. The smart speaker also lets you stream music, watch Netflix, and more! Smartphone activity alerts: When the Nest Cam Outdoor detects motion or sound it sends you an alert as well as a photo of the triggering event. That way you'll never be in the dark when it comes to your home security. Built in speaker and microphone: Enter the Nest app to see the Cam's live stream and talk to anyone who may be nearby. This is a great way to let potential intruders know you're watching and stop break-ins before they happen. Simple smart home control: Thankfully, the days of juggling multiple apps are over. The Google Home Hub makes it possible to control all your connected devices, including the Nest Cam Outdoor, from its touchscreen interface. 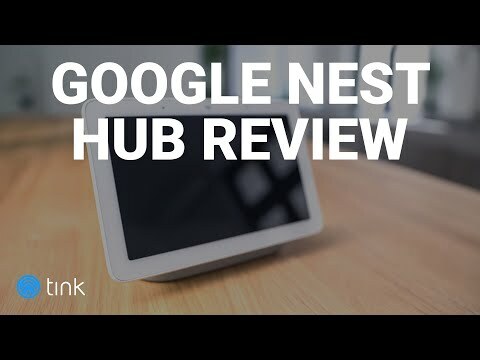 Built in Google Assistant: The Google Home Hub is a smart speaker, which means you'll be able to say something like "Hey Google, show me the front porch" to begin watching the Nest Cam's video stream on the Hub's screen. Impeccable video quality: The Nest Cam Outdoor captures video in crisp 1080p HD and night vision. With 8x digital zoom you can feel assured you won't miss any important details. Get your smart home off to a great start with this dependable outdoor secruity camera and smart speaker combo. The Nest Cam Outdoor mounts easily on the outside of your property and keeps you informed of important events by sending you phone notifications. That means you'll just have to open the Nest app to see exactly what's happening at home. The Google Home Hub is the clever smart home controller that lets you manage all your connected devices with your voice. Both the Nest Cam Outdoor and Google Home Hub are multifunctional products that enable you to cut out the noise and gain quick access to all essential smart home features. Say good-bye to managing multiple apps and experience the comfort that comes with controlling all your connected devices with the Google Home Hub. The Hub lets you create different routines, so you can arrange for multiple devices to turn on or off at once. For example, you could set a morning routine that has the coffee machine and bedroom lights turn on at 7 A.M. You can also have the Hub show you live video from the Nest Cam Outdoor. The Hub also works as a music speaker, digital photo album, and can even give you weather updates and answer questions. Person Detection: The Cam will be able to differentiate between people and things. Activity Zones: Have the Cam pay more attention to vulnerable areas, like the driveway or front door. Create Clips: Curate, cut, and share video clips with neighbors and police for a safer neighborhood. Once plugged in, mounted, and the apps have been downloaded, you'll be ready to add the devices to your smart home network. High definition video and top quality video sensors mean you'll never miss an important moment. The Google Home Hub and Nest Cam Outdoor communicate flawlessly with one another. Data is encrypted according to the AES 128 Bit TLS/SSL standard. Nest’s Cloud Servers are based both in the U.S and Ireland, meaning they're subject to EU encryption standards. A fair price for a valuable addition to any smart home. How much does a Nest Aware subscription cost? Is the Nest Cam Outdoor wired? Yes, the Nest Cam Outdoor is wired, so you won't need to worry about keeping an eye on dying batteries. Does the Google Home Hub have a built in camera? No, the Google Home Hub does not have a camera.